We are continuing Family Pricing, but it applies only if the books are pre-ordered during this school year. There is no guarantee of purchasing books at delivery. If you have any questions, please do not hesitate to contact Ms. Courtney. To better serve our families, the yearbook staff is offering “Family Pricing.” As most of our families have multiple children, we are hoping this cost savings will be an incentive to purchase each child their own book of memories! 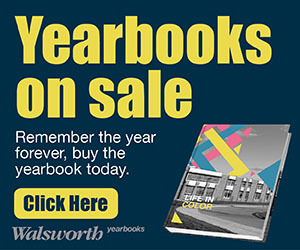 Family pricing allows parents who purchase multiple yearbooks a lower cost for additional books. Two easy ways to reserve your 2019 Mem-O-Re! Orders must be received by April 15. 1) Simply fill out the form and return it to the school office with payment. 2) Click the Walsworth graphic below. Complete your information online and pay with a credit card.